Thanksgiving is coming, and I’ve got 40 amazingly delicious ways to use up all that leftover turkey. These leftover turkey recipes will please any crowd! From sandwiches to soups to casseroles, there are so many great turkey recipes that will make your leftovers anything but boring. Tired of the same old leftovers and need a change? I have just the thing for you. 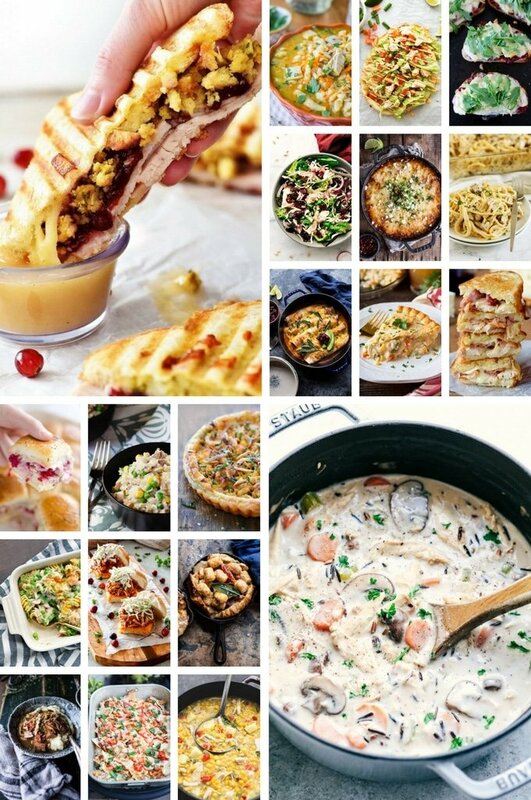 With these fantastic leftover turkey recipes, your taste buds will be asking for more. Make the perfect holiday turkey and of course, save your leftovers! 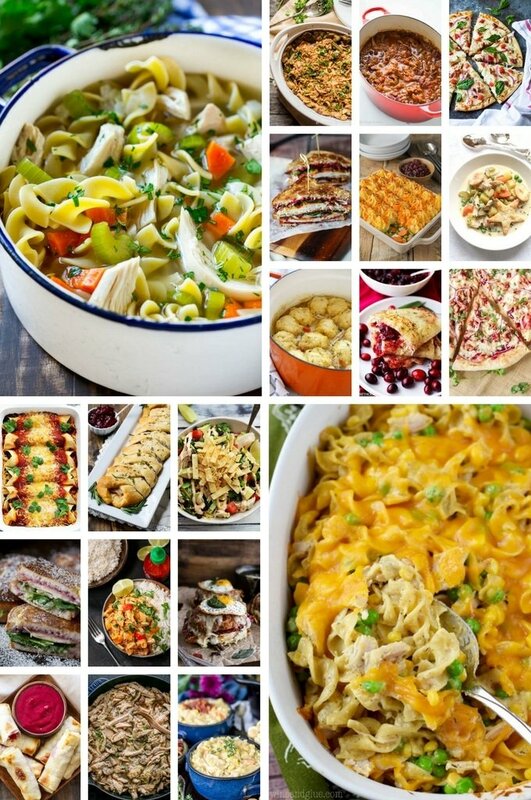 From mouthwatering casseroles to toasty turkey paninis and everything in between you are sure to find a new family favorite. While holiday meals are great, sometimes the leftovers can be even better the next day! Whether you’re looking for something lighter like a salad, or a unique dish like a Thai curry, I’ve got you covered. Leftover turkey can be frozen and stored for months as well. I stock up on gallon sized resealable freezer bags and remove the bones to freeze all my turkey. This comes in handy when you get a craving. It’s also a lifesaver as many of these meals you can prep in advance and freeze. It’s a great way to make dinner planning easy for those busy nights of sports and errands. 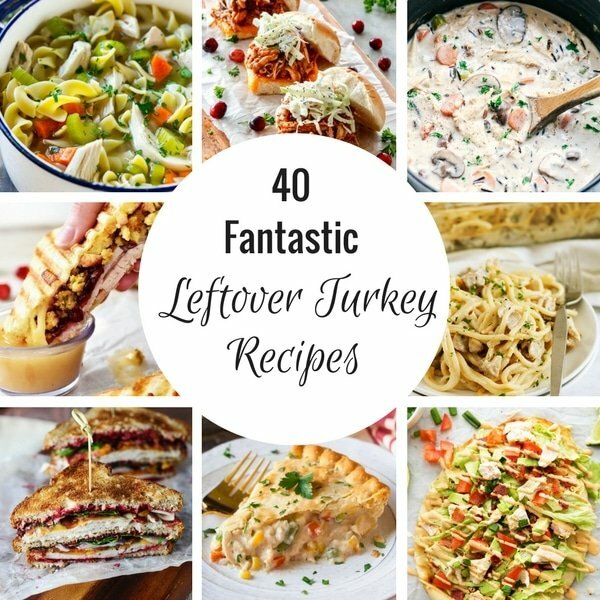 Do you have some favorite leftover turkey recipes? Id love to hear about it in the comments. Share a photo as well! Cooked turkey will stay good in the refrigerator for 3-4 days, and can last in the freezer for up to 4 months. I typically freeze any leftover turkey after the first few days, and I package it in 2-3 cup portions so that I can thaw exactly what I need for the recipe I’m making. How do you store leftover turkey? The easiest way to store leftover turkey is to slice it from the bird and store it in an airtight sealed container in the refrigerator. If you’re planning to freeze your turkey, I recommend cutting it into bite sized pieces and storing it in freezer bags until you’re ready to use it. How do you reheat leftover turkey? The simplest way to reheat leftover turkey is to place the slices in a baking dish covered with foil, then bake at 275 degrees F for 5 minutes per pound, or until a thermometer registers 130 degrees F.
Chicken noodle soup is always a favorite, but how about an easy and comforting turkey noodle soup for a cold day? This turkey noodle soup is full of leftover cooked turkey, colorful veggies and tender egg noodles, all in a savory broth. It’s an easy to make dish that’s perfect for using up your leftovers. You can add more vegetables to this soup if you like. Some great options are green beans, corn, or even potatoes. I typically use curly egg noodles, but any short pasta will work just fine. You can also make this soup in the slow cooker. Add all of the ingredients to the crock pot except for the noodles and parsley. Cook on low heat for 4 hours, then stir in the noodles and cook for another 20 minutes. Sprinkle with parsley, then serve. My kids love this recipe, they anticipate the next-day soup almost as much as they anticipate the holiday meal! 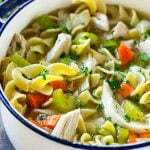 This turkey noodle soup is the perfect way to use up leftover turkey! Melt the butter in a large pot over medium high heat. Add the onion, celery and carrots and season the vegetables with salt and pepper to taste. Cook for 4-6 minutes or until vegetables are just softened. Add the garlic and cook for 30 seconds more. Add the thyme, broth and turkey to the pot and bring to a simmer. Cook for 20 minutes or until vegetables are tender. Add the noodles to the pot and cook for the time that's listed on the package. Stir in the parsley and add more salt and pepper to taste. Serve. This recipe was so easy and tasted amazing. Great way to use leftover turkey. I pinned this! Definitely cant wait for some turkey leftovers and to spin it into a new dish! I am bookmarking this article so I can download the recipes that I haven’t tried before. Sometime we can’t help but have a few leftover turkey so this post is just so timely. Thanks for sharing! Thanks for this recipe round up. I hate having food go to waste. My family is not really picky so “recycling” left overs into a totally new dish is very welcome in my family. I love leftover turkey recipes! I often buy a larger turkey than what I need just so I have plenty of leftovers. Just by looking at the photos I can tell there are some great recipes here. I’ll be Pinning this for after we have Thanksgiving – those turkeys are huge. Wow… this is great. Sooo many options, I think I’ll make turkey now since you have me craving so many of these ideas. I never know what to do with all the leftover turkey we have. These are some great options. This list is just in time! I always have leftovers on Thanksgiving. What an awesomely delicious list! Forget using left overs. I am tempted to buy a whole turkey just to make these recipes anyway! These are all awesome! I love trying out new creative ways to use up leftovers. I really want to try the Thanksgiving pizza. That sounds great! I appreciate these ideas because it’s not always fun to deal with the leftovers! I think these are great ways to enjoy them than having to eat the same thing over and over again. Turkey Cranberry Quesadillas could be fun. I may have to set aside some of the extra cranberries too! This is awesome! I am bookmarking this to use EVERY year. I never know what to do with all my leftover turkey.